This 1853 Childs & Hammond map exhibits the proposed route of the New Orleans, Opelousas and Great Western Railroad. 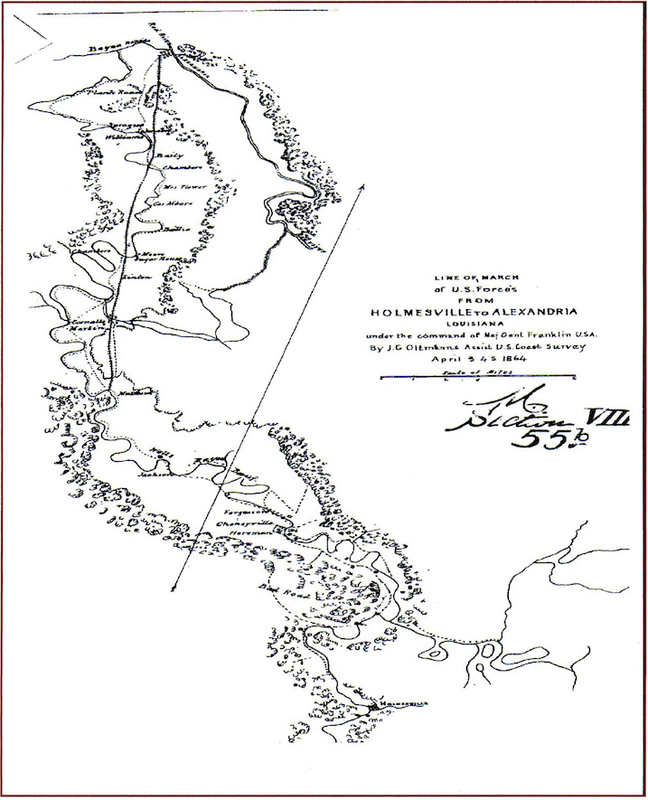 This is the first significant map to illustrate the location of the village of Holmesville, Louisiana. The Great Western Railroad was opened for the first 50 miles on March 6, 1854 from New Orleans to Vermillion (Lafayette). 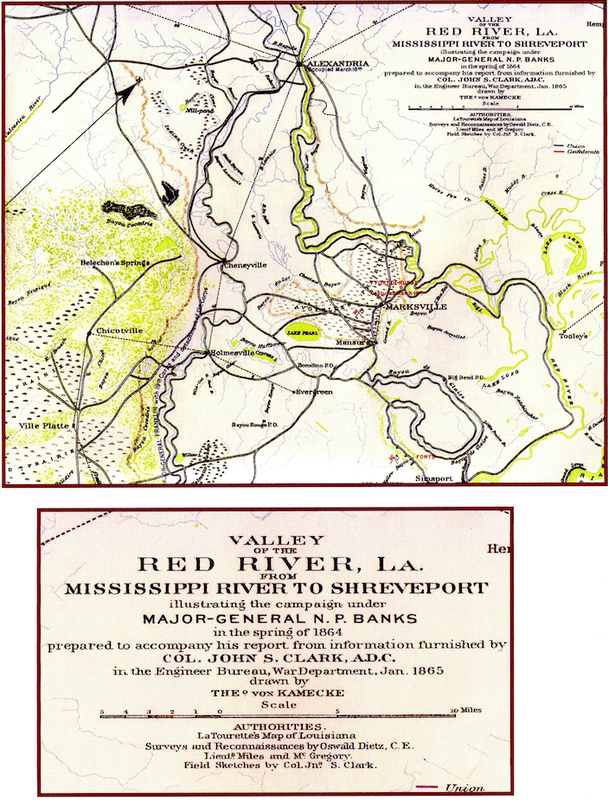 Upon being purchased by Morgan's Louisiana and Texas Railroad Company in 1878, the second sector from Vermillion to Washington was completed in 1881 and to Cheneyville in 1882. Because the track missed the village of Holmesville by one mile, a new village, Eola, was established next to the newly completed railroad in 1881. When this happened, many of the inhabitants of Holmesville moved to the new village of Eola. In the early 1880's, Morgan's Louisiana and Texas Railroad Company was purchased by the Southern Pacific Railroad Company. 1873 survey map of Southwestern Avoyelles Parish listing Holmesville and some of the original patent land grant owners. Please note that the only village noted on this map is Holmesville. The small bayou under the name Holmesville is the Watermelon Bayou. (Courtesy of Randy Decuir). This is an excellent 1939 survey performed by Haas Shults of 'F. Shults' & Sons, Civil Engineers of Lake Charles to clarify property boundaries at the request of the Amerada Petroleum Corporation. ("Community Acerage" as depicted on this plat indicates the allocated twenty acres that is required to drill one well). 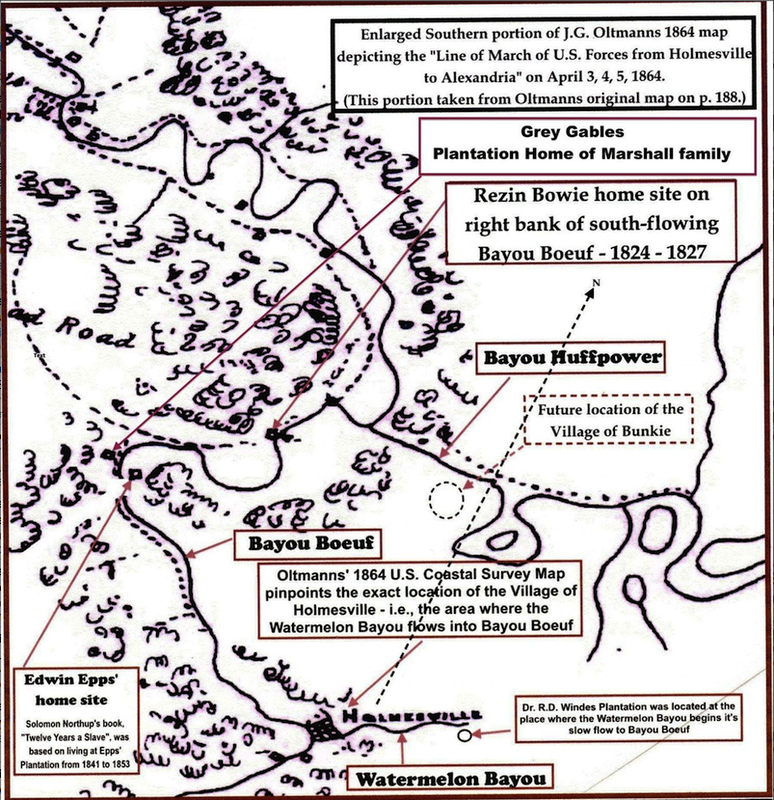 Note: From the early 1800s until 1830 the Bayou Boeuf area from the Bowie site to Holmesville was called "Bayou Boeuf Village, or simply "Bayou Boeuf". In 1830 this name was changed to Holmesville. This is a portion of J.G. Oltmanns' Civil War map. 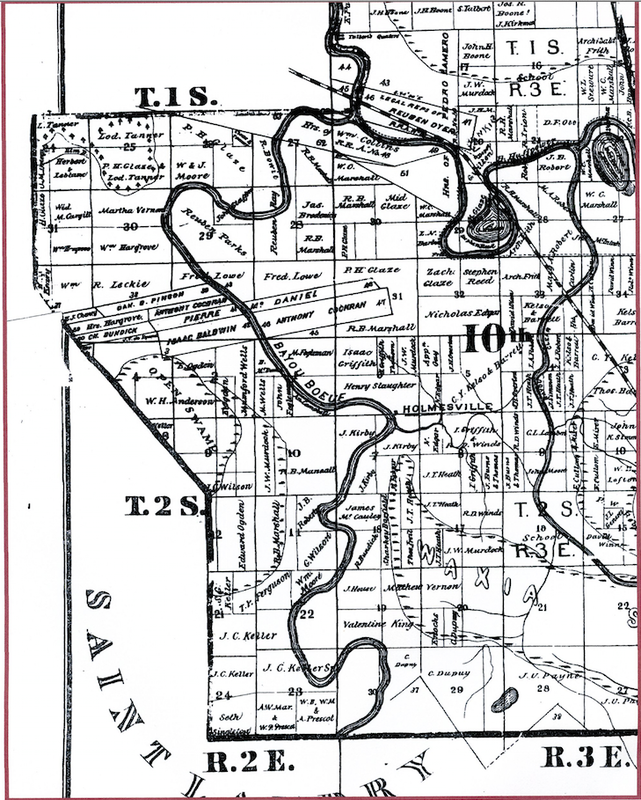 In his map, there are small black squares to indicate residences/homes along Bayou Boeuf. 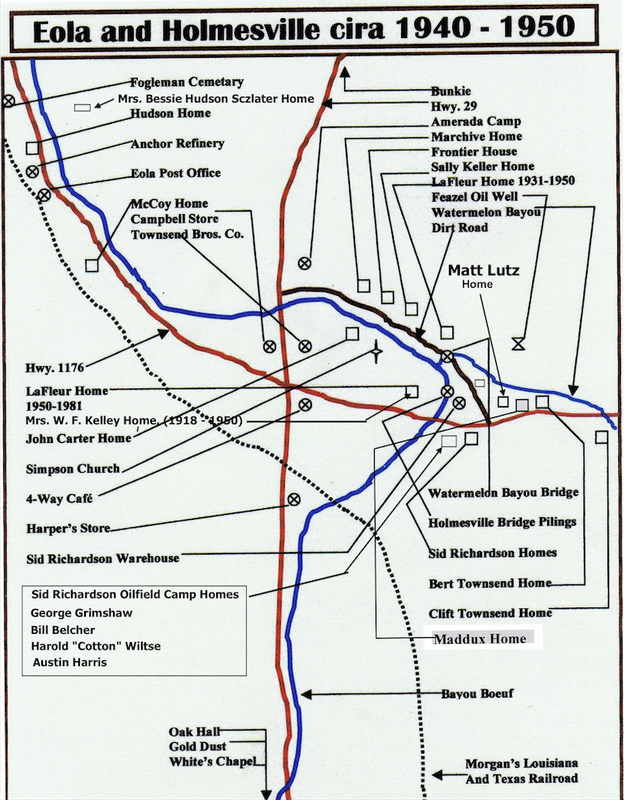 The home sites of Rezin Bowie (he lived here from 1824 to 1827) and also Edwin Epps (of Solomon Northup fame) are depicted as being at the locations noted above on Oltmanns' map. 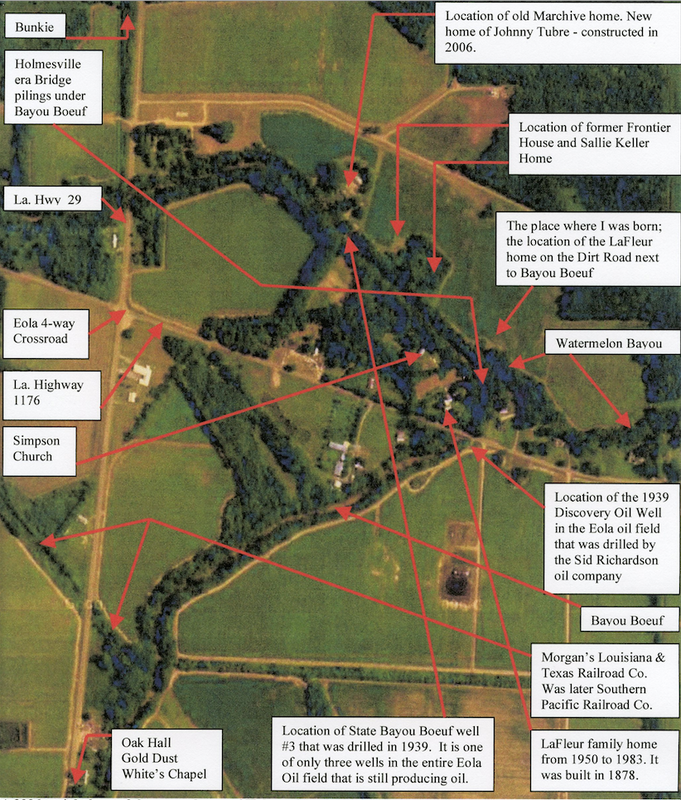 The Rezin Bowie home site is approximately four miles upstream on Bayou Boeuf from Holmesville while the Epps farm was three miles up-stream. 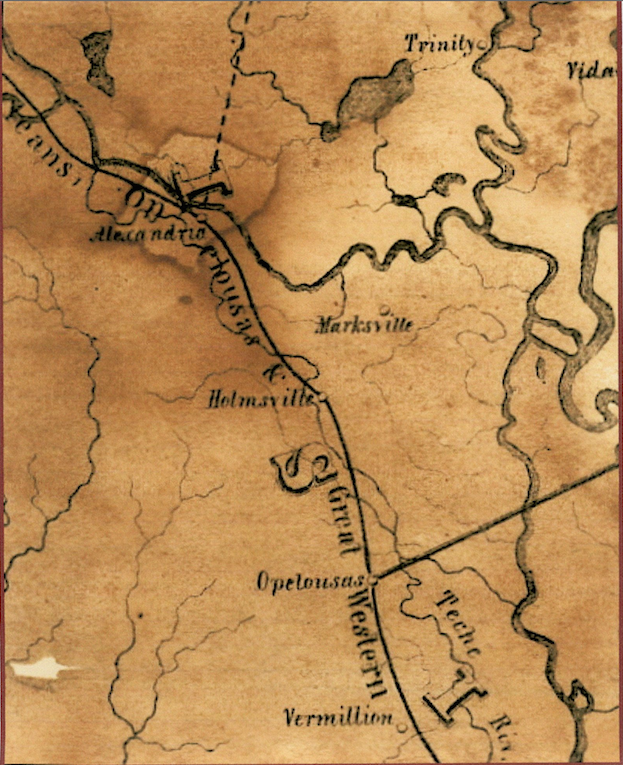 Oltmanns' 1864 map depicts the location of Holmesville as being the area where the Watermelon Bayou flows into Bayou Boeuf. "Line of March of U.S. Forces from Holmesville to Alexandria"
The purpose of inserting this map into this website is simply to note the proximity of Holmesville to other central Louisiana localities during General Nathanial Banks "Red River Campaign" in 1864. For example: "Chicotville" is 14 miles from Holmesville; Evergreen is 8 miles and Cheneyville is 15 miles. (Interestingly, upon being drafted into the US Army in 1958, one of my three locations I was sent during my two years as a draftee, was Fort Banks located at Winthrop, Massachusetts - named in honor of General Nathaniel Banks). Old Holmesville as it appeared between 1940 and 1950.